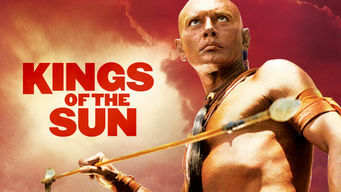 How to watch Kings of the Sun (1963) on Netflix France! Sorry, Kings of the Sun is not available on French Netflix, but you can unlock it right now in France and start watching! With a few simple steps you can change your Netflix region to a country like United Kingdom and start watching British Netflix, which includes Kings of the Sun. We'll keep checking Netflix France for Kings of the Sun, and this page will be updated with any changes. Kings of the Sun is not available in France BUT it can be unlocked and viewed! After a Mayan king captures the leader of an attacking Native American tribe, the rival rulers are forced to form an alliance against a mutual threat. A band of Mayans and hostile Native Americans make a tenuous peace. Can their alliance withstand a massive new attack? There is a way to watch Kings of the Sun in France, even though it isn't currently available on Netflix locally. What you need is a system that lets you change your Netflix country. With a few simple steps you can be watching Kings of the Sun and thousands of other titles! Watch "Kings of the Sun"